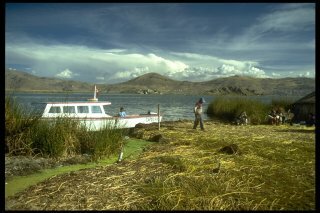 Here is a landscape from the shores of Lake Titicaca in Peru - the Uros floating reed villages. The camera used was a Canon AE1 with a 28-70 zoom and a polarising filter. Film was Kodak Ektachrome 100. The sky is typical of that altitude in the Andes. 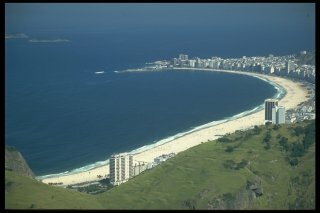 This is a a view of the famous Copacabana beach taken from the Pao do Acucar [Sugar Loaf Mountain] in Rio de Janeiro. It's a shame about the haze - but this tells the story of the pollution affecting that part of the world.